Save on costs without skimping on sound with the 6 Zone Multi-room Audio Kit for Housewide Audio available at Outdoor Speaker Depot. You can fill your entire home with rich-sounding audio that includes a high current amplifier, volume controls and a speaker selector. The type of music you favor should influence the type of speaker you use with this easily installed audio kit: choose the Custom Series for easy listening, High Definition series to bring out bass or Kevlar Series for critical listening that accentuates every minute detail in a recording. The 6 Zone Multi-room Audio Kit allows you to control the volume in each room from the volume control in that room, so you can connect just about any source that uses RCA and/or a 3.5mm cable, such as an iPhone, iPad, laptop or CD Player. Order from Outdoor Speaker Depot on a weekday and your kit should ship out the same day the order is placed. How to choose the right speaker size? Choosing speakers based on room size is quite simple. Our 5 1/4" speakers are great for smaller rooms (150 sq ft room or less). If the room is larger, go with a 6 1/2" speakers, and rooms greater than 400 sq ft will benefit from our 8" models. What speaker type should I choose? This depends on your budget and what kind of performance you expect from speakers. Our Custom Series speakers are great for background level to easy listening music. If you like your tunes on the louder side and prefer deep bass, think about our High Definition series. If you are a top-of-the-line type of listener who hears every little detail, you will love our Kevlar series speakers. The Kevlar series has the best overall sound and is suitable for critical listening such as home theater use and for the audiophile listeners. We also have Trimless models for those who wish to have the speakers that blend in with the decor. This multi-room audio system will allow you to control 6 zones in your home with ease. 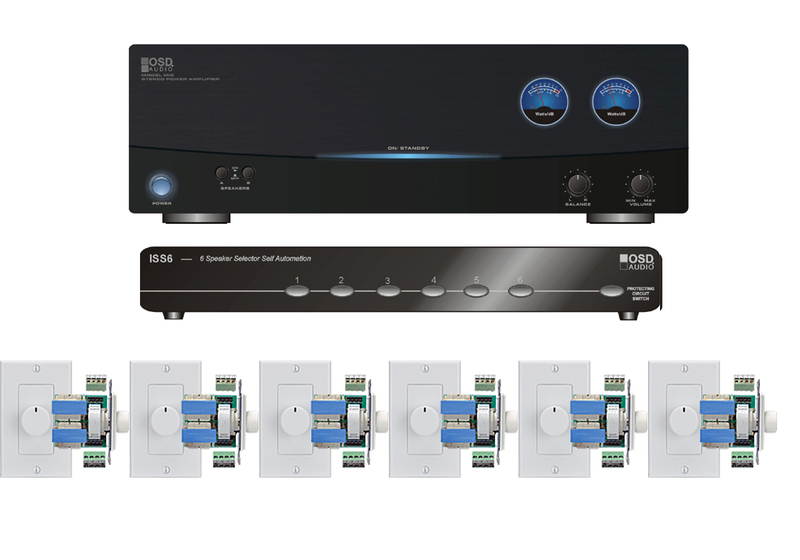 This simple system has everything you need to setup your multi-room audio. All you need is to pick out your speakers and run the wires. You will have music in your rooms in no time. I want to run a whole house audio system â€¦. not what route to go and how it will work in conjunction with my surround sound â€¦.so what I have with surround sound is a Denon AVRS730H 7.2 Channel AV Receiver with Built-in HEOS wireless technology with 2 Klipsch R112 SWI subs ..Klipsch 6.5" Center Channel Speaker - RC62 II â€¦. 2 Klipsch RF26 â€¦.2 Klipsch RF28 and that sounds amazing and this is in my bedroom which is 450 sq ft ... but I would like to add a whole house system and wiring is not a problem I can put a wire anywhere ..I have a lot of access but I'm also an amazing drywaller so what I have as far as speakers 6 x Yamaha NS-ICS600 60w+60w RMS and 2 x Polk Audio RC85i 2-way" Speakers â€¦.and 2 Klipsch AW-400 for the patio.. .and I want to run this in 4 zones.... I have 2 receivers not in use but are available to be used.. Yamaha R-S202 Receiver and a Onkyo Network Stereo Receiver with Built-In HDMI Wi-Fi & Bluetooth one 1 .. Is in the large living room approx. 300 sq feet.... zone 2 is a sitting room 200sq.ft â€¦ approx. â€¦..zone 3 kitchen/dining area 350 sqft approx. ...zone 4 the patio so I have a few questions 1st.. is the 6 zone a good fit for me 2. Am I going to need another Sub woofer downstairs where all these rooms are or multiple subs ? do I need to run a different receiver or can I run the one I got going on right now? Similar to Ian from St. Louis, we just moved into a new house that has wired speakers in 5 rooms/zones. 1 speaker in the entry, 2 speakers in the kitchen, 2 in the game room, 2 outside and a 5:1 in the great room. We believe they are 6 1/2" speakers covered by a 10" speaker cover? We have no volume controls on the walls and have a large bundle of speaker wires (labeled) coming out of the wall in the great room. We have an old (20+ years) receiver that we haven't hooked up, figuring that we need to replace it anyway, but our goal is to be able to use an app from our phone and/or a remote (that lives in each room?) to control all 5 zones individually (with the 5:1 needing special volume adjusting abilities?). We want to be able to pull from audio that is online (pandora etc.) or that is stored on a portable usb drive either connected to the computer or directly attached to the receiver (if that's a thing)?. We are assuming that the 6 zone audio kit would get us most of the way there? Does it have bluetooth capability or is that a requirement of the receiver? What smartphone apps work the best for controlling a 5 zone (one zone being a 5:1). What other pieces would we need to buy? Do we need the volume controls on the wall if we are controlling the system via a bluetooth app? or is it good to have both? Thanks for your help. So I am looking at this amp/ multi room kit to power 4 pairs or ice840 speakers and 1 pair of ice640WRS speakers and 1 pair of ice840WRS speakers for our whole house audio system in our new construction home I’m worried how loud this will be? Is this enough power to run several rooms at the same time and have it sound good and be loud enough? I am planning on also adding a powered sub with a wall jack in the house and on the patio so the sub can be moved if needed. I am looking at the OSD-6-zone-kit combined with the Ice520 for 4 rooms, the Ice610 for one room, and the Ice800 for one room. Will this package work ok? Also do you have to put two speakers in each room to get the left and right channels to hear the music correctly? Or can I just run one wire from speaker selector to volume control, then to speaker? Hello - we just had a new home built and had prewiring down for whole house music. We have a pair of speakers in the Master Bedroom, office and covered patio. Also have 5 in the great room. I would like to set the great room up for surround sound for movies, but use for background music at times. Will this 6 Zone Multi-room audio kit work for what I'm looking to do. Also, if great room is being used for surround sound as well, I imagine these speakers may be different than the pair of speakers in the other 3 areas? Thanks for you help. I moved into a new house with speakers in at least 4 rooms and out back on the patio. They're all ran to a central place and some at least are marked. Every room with speakers has a dial in the wall with an IR looking circle on it. I don't know anything about any of this. What do I need to make all this nonsense work? I'm running an onkyo nr 3030 7-2-4 with 2 g28 1 g42 2 g16 2 g12 , 4 klipsch 6803c in the basement , i have 5 other zones 2 speakers living room , 2 in the kitchen 6803c , 2 g12's in exercise room , 2 speakers for the deck ( not purchased ) 2 for the yard ( not purchased ) can I control music selection via ipad or another device from first floor , will I experience quality stereo from reciever in other zones and is this the correct audio kit ? What speakers would you suggest for outdoors for simular quality. Hi John, This is a great system to run 6 pairs of speakers running one music source at a time. If you are hoping to run multiple music sources simultaneously, unfortunately this system won't be able to do that. Since it's analog, there's no way to connect wirelessly unless you get yourself a wireless or Bluetooth adapter/receiver that can plug into the amp via RCA cable. I have 6 rooms and want to control everything throw my iPad. Like each room can play there own song and volume control. Is this possible? If so what do I need as far as a receiver and selector? Hi Tim, You can run multiple zones with this bundle, but not multiple sources simultaneously. The BA-6640MS can run 6 zones and 6 sources. I currently have speaker wire run for 6 rooms (2 speakers per room) does this kit allow you to control each zone volume independent of one another from the unit or only through the volume knobs? Can a ipod, radio, cd-player, and record player all be connected to this unit? On this system, I want to find a receiver/ipod dock to feed audio to this amp but not showing the I/O side, I can't see what input configurations are available. Do you have an inexpensive receiver/ipod dock available? Can I set up a 6 speaker system without using the wall mounted volume controls? HI: I am about to embark on a Multi room audio set up as well as a home theater system. I have already got the 4 core speaker wiring installed to the indoor and outdoor audio locations as well as volume control locations/boxes in each room. I think I have 5 zones ( 5 separate pairs of speakers) plus 2 outdoor speakers and a single master bathroom speaker which I guess I can install as part of the other zones. That is, I assume one of the zones can have 2 pairs of speakers( this is for an outdoor patio and an outdoor loggia area) , and the other zone one pair of speakers and a single speaker (this is for a master bedroom and master bathroom setup). For the home theater I am looking at either a 5.1 or 7.1 system depending on how I would connect the house system. I plan on multiple inputs for the home theater/stereo surround sound system (DVD, CD, Internet, Turntable, tuner etc) and an LED flat panel TV. I would want to be able to imput audio to the house system from the CD player, tuner/receiver and internet radio. So, I am trying to determine what to buy for: Speakers Volume Controls multi zone amplifier if needed for house system Home theater/surround sound amp/receiver for that. And then, how to wire it all together so that I dont blow anything up or fry anything. Thanks for your input and recommendations. Do I need to have all 6 zones hooked up? I only have 4 zones and the 4 zone system is out of stock. Can I use plain speaker wire? I have a question about the impedance setting for my size zone system. I have one pair of speakers in three separate zones (3 sets in total). Then, I have two pairs of speakers wired in parallel in the fourth zone. So, should I consider this 4 pairs or 5 pairs of speakers for the impedance? And, does it matter if I have a fifth zone wired, but no speakers attached (to be used as some future date)? Thanks! I am planning to purchase the 6 zone kit and I would like run two sets of speakers in one of the rooms. Could you advise how to wire the two sets of speakers so that I use just one volume controller? Thanks! Can you run more than just 2 speakers per zone? I envision 6 or 8 speakers in a deck / patio area (1000 +/- SF) and plan to use it as a single zone, while eventually installing additional zones inside the house. If I want to run 6 zones, can I just use a speaker switch rather than buying an amp too? I have a JVC receiver that receives RCA inputs from several sources and amplifies signal to two sets of speakers. I want to increase the number of rooms I have music in. The only output on the JVC are the two sets of speaker outputs, which are the push-button outputs that accept a bare speaker wire. Can I use speaker wire to connect one of these outputs to an input on the AMP300? What that means is connecting an amped signal to the AMP 300. Thanks. Would this system be available for interational install ie@UK /Hz 50Hz and is it considered to be "Marine Grade" for Ocean Side Home install. Would this unit be suitable to accept a preamp line output from a stereo reciever and connect an ISS4 speaker selector to each of the AB speaker outputs to power 2 stereo speakers with volume controls in 8 zones? If so, what would the package price be for the amplifier unit with one ISS4 and seven volume controls as I have purchased one volume control and one ISS4 unit from you previously? I have a Yamaha Receiver that I would like to use to hook up our XM, IPOD and turntable to and be able to play music to 6 different room in our house and this looks like the system to use, but would like some guidance on whether or not this is the right system? This system will work perfectly fine whether your Yamaha receiver has a low-level signal out or only a speaker level output. The AMP300 has multiple input connections to handle any application. It will also give you a second source option as well. This will provide plenty of power to the whole system. OSD also has a number of affordable speaker options for in-wall, in-ceiling, patio or rock speakers. You can also add powered subwoofers to your system as well.